Underprivileged children in Chelsea? Yes, there are. Its all too easy to forget that there are many children who come from difficult homes in Chelsea, and Christ Church is a state-funded primary school that despite an impressive Ofsted rating, it also has one of the highest proportions of special needs and underprivileged children in the country. 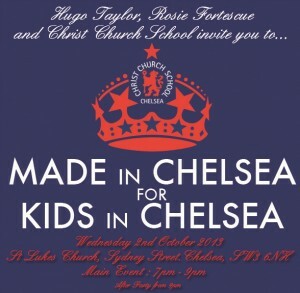 On Wednesday 2nd October the The cast from Made in Chelsea aim to raise £20,000 in just two hours. Hugo Taylor and Rosie Fortescue are hosting an amazing charity evening from 7pm-9pm, including and a one off performance from X-Factor star Eemia and local residents, businesses and parents will all be about in force supporting this fantastic event. Located in the heart of Chelsea, Christ Church is an important and special community school that needs help because it cannot access the funding of larger state schools, and so it is being pro-active in getting its own funding. The money raised will help them in many aspects – notably school food and technology. Made in Chelsea for Kids in Chelsea is a real community-based event where for the first time Chelsea businesses are helping a small local state school. Every pound raised will make a huge difference to the school and the life of every child who attends Christ Church. So, if you are Made in Chelsea, live in Chelsea, work in Chelsea or even go to school in Chelsea, then you should definitely support this event, afterall, charity really should begin at home.